Adding pumpkin to latkes improves their nutritional value by giving a healthy dose of Vitamin A and antioxidants. One waffle gives you 43% of your daily requirement of Vitamin A and only 1 gram of fat (see the Nutrition Facts below the recipe). It’s also a great way to add a vegetable portion to a traditionally starchy meal like latkes. Last year I started cooking latkes on my non-stick-waffle iron as a way to avoid all the oil customarily used to fry latkes in a pan. The waffle iron also makes the clean-up afterwards a lot easier. Any suggestions for preparing Pumpkin Latke Waffles? Prepare your Pumpkin Latke Waffles as a sweet dish with a mixture of cinnamon, cloves, nutmeg and ginger in good old pumpkin pie fashion, Or make your Pumpkin Latte Waffles for a savory dish with a mixture of any of the following: cumin, coriander, cinnamon, cayenne pepper, or curry spices (the 5 Cs). Thyme or sage, with or without a handful of grated Parmesan cheese, are also fine choices for savory waffles. Pumpkin Latke Waffles can be served with any of the traditional latke toppings, such as applesauce, sour cream, or jam as well as cranberry sauce, fresh fruit, or yogurt. They can also be served in the same way as ordinary waffles: with eggs or maple syrup on top. 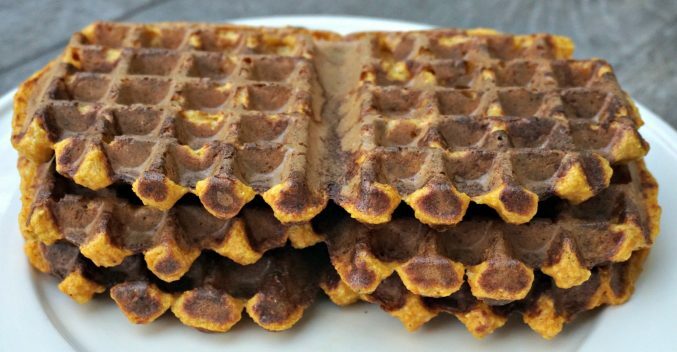 If you are feeling bold, try your Pumpkin Latte Waffles as a sandwich for a veggie or meat patty. I hope this basic recipe will inspire you to create your own way of eating Pumpkin Latke Waffles. Feel free to modify the ingredients to fit your needs or to use leftovers. These waffles are an ideal way to use leftovers after Thanksgiving: pumpkin, potatoes (mashed or boiled), and cranberry sauce. 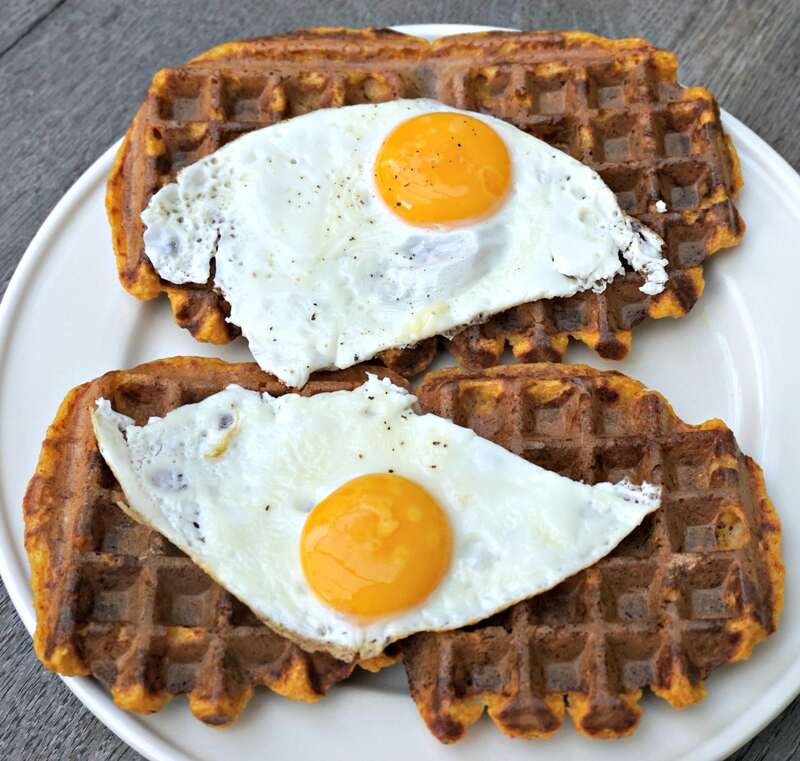 Please share with me in the comments below the ways you have prepared Pumpkin Latke Waffles. Add photos if you can. Don’t forget to use the share buttons below to forward this recipe to your friends. Pumpkin Latke Waffles are a tasty, healthy, and easy way to use leftovers after Thanksgiving or to celebrate Hanukkah. If preparing your own pumpkin puree, see instructions by following the link above in the list of ingredients. Put the pumpkin puree and cooked or grated raw potatoes in a mixing bowl. Blend together until you have a fairly smooth consistency. Latkes do not need to be smooth so don't worry of there are chunks or pieces. See notes below. Mix the flour with the baking powder. Add the flour about a third at a time and mix together lightly. See notes below. The consistency should be like a cake batter or thick pancake batter. You may not need all of the flour. Follow the instructions for your waffle iron. Since mine is non-stick, no oil is needed. You may need to add 1 tablespoon vegetable oil to the batter or to your iron before cooking. Continue cooking the waffles in batches. On my iron, I was able to make 4 x 2 large rectangular waffles weighing about 65g (2 oz) each. It took about 9 minutes to cook on my waffle iron, but this may be different on yours. Serve with the toppings you want and enjoy. If you use grated raw potatoes, make sure you put them in a fine strainer for about 30 minutes and then squeeze out any excess liquid. You can also wrap the grated raw potatoes in a cheese cloth and wring out the liquid. For the flour, feel free to use half white flour and half whole wheat flour. You may also blend other flours or grains to replace the same amount of flour. For instance, I put 1/3 flour, 1/3 oat bran and 1/3 pre-cooked polenta.